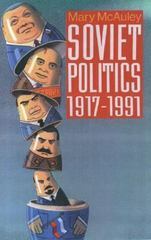 Soviet Politics 1917-1991 0 Edition Now available in paperback, this timely work offers an authoritative and lively history of the entire spectrum of Soviet politics, from the rise of Lenin and the October Revolution of 1917 to the emergence of the Commonwealth of Independent States. It discusses in fascinating detail how Lenin's Communist party transformed the Tsarist empire, why Stalin's massive program to industrialize was coupled with one of the most horrific terror campaigns in history, and what we can expect from this erstwhile superpower in the years ahead. Based on extensive research and first-hand knowledge of the Soviet system, it offers a lucid and stimulating analysis of the developments which first sustained, then finally undermined, the Soviet state, pinpointing all the key political developments--revolution, state-building, party rule, terror, Nazi invasion, the Cold War, and the recent elections--and examining their significance in an especially well-wrought historical context. Timely, cogent, and comprehensive, Soviet Politics helps readers make sense of developments in the former USSR since 1985, showing how and why the system fell apart. It will interest anyone wanting a fuller understanding of current events, and their consequences for the world as a whole.